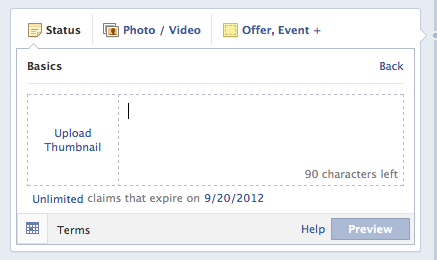 Facebook Offers are now available to all Pages with 400 or more Likes. Great, right?? Well, there’s a caveat: It’ll cost ya. I know, I know. This is bad news. I’ll get to that in a moment. But let’s start from the top. I’d consider these to be some pretty significant upgrades. 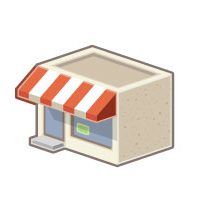 Previously, any online business needed to perform a workaround to get access to Offers. Now the Offer includes both a redemption code and a link to the product you are selling. This is a great addition. Anyone who previously tried to create Offers for online businesses had to get creative when it came to redemption. The best option was typically to instruct consumers to forward the redemption confirmation email. Just not a good process. So now you can forward your customer to the direct page where your product exists, and you can provide a redemption code that they can use. Okay, now what everyone wants to talk about… Cost. Yes, the old Facebook Offers were completely free. Completely awesome. And completely too good to be true. 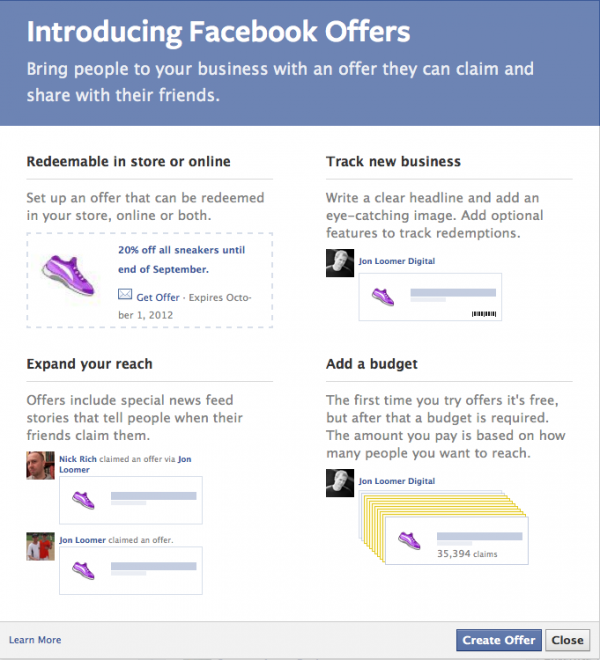 When you use the new Facebook Offers, your first campaign will be free. Your second will cost a minimum of $5-10. It’s not clear yet exactly how this will work, but it appears that Offers are essentially being combined with Promoted Posts. In other words, you aren’t paying for both, but you’ll be paying what you’d typically pay to promote a Facebook Post. There just won’t be an option. Again, that’s based on the disjointed information I’ve heard so far, but it would make sense. It’s at least better than double dipping, paying both to create an Offer and then to promote it. 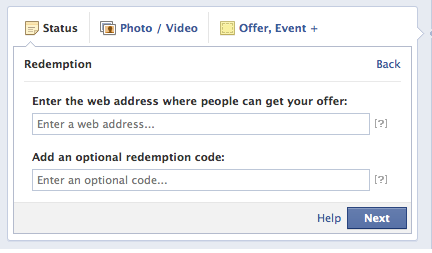 Personally, I can’t imagine I’d create a Facebook Offer without promoting it anyway. Then again, I won’t create Offers very often for my online business. Those who will suffer the most from this are the businesses that use Offers regularly as a core part of their strategy, particularly small businesses. I imagine they’ll use Offers far less often now than they did before. But I strongly advise that, assuming they were having success with Offers before, they continue to use them. I know there is an initial sting. But if it’s effective and brought in revenue, you should be willing to pay a price for it. If it’s not, then you shouldn’t. 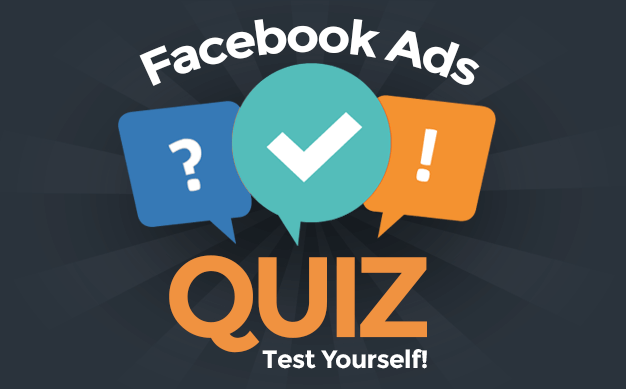 So it’s now time to lump Offers under the rest of Facebook Advertising umbrella. I’m still a big advocate of Facebook ads, so I’m not going to suddenly tell you not to use Offers. Offers tend to be extremely effective, so I’d still suggest using them in the right situations. As always, you should be smart. Don’t throw your money away. Monitor the results and adjust. How about you? Will you still be using Offers now that you’ll need to pay?